The initial discovery, made by the Kepler Space Telescope, is one of a handful of smaller planets found by Kepler and verified using large ground-based telescopes. “What makes this finding particularly compelling is that this Earth-sized planet, one of five orbiting this star, which is cooler than the Sun, resides in a temperate region where water could exist in liquid form,” said Elisa Quintana of the SETI Institute and NASA Ames Research Center who led the paper published in the current issue of the journal Science. The region in which this planet orbits its star is called the habitable zone, as it is thought that life would most likely form on planets with liquid water. With such a small host star, the team employed a technique that eliminated the possibility that either a background star or a stellar companion could be mimicking what Kepler detected. To do this, the team obtained extremely high spatial resolution observations from the eight-meter Gemini North telescope on Mauna Kea using a technique called speckle imaging, as well as adaptive optics (AO) observations from the 10-meter Keck II telescope, Gemini’s neighbor on Mauna Kea. Together, these data allowed the team to rule out sources close enough to the star’s line-of-sight to confound the Kepler evidence, and conclude that Kepler’s detected signal has to be from a small planet transiting its host star. The Gemini “speckle” data directly imaged the system to within about 400 million miles (about 4 AU, approximately equal to the orbit of Jupiter in our solar system) of the host star and confirmed that there were no other stellar size objects orbiting within this radius from the star. Augmenting this, the Keck AO observations probed a larger region around the star but to fainter limits. The planet designated Kepler-186f is earth-sized and orbits within the star’s habitable zone. The host star, Kepler-186, is an M1-type dwarf star relatively close to our solar system, at about 500 light years and is in the constellation of Cygnus. The star is very dim, being more than half a million times fainter than the faintest stars we can see with the naked eye. Five small planets have been found orbiting this star, four of which are in very short-period orbits and are very hot. The Kepler evidence for this planetary system comes from the detection of planetary transits. These transits can be thought of as tiny eclipses of the host star by a planet (or planets) as seen from the Earth. When such planets block part of the star’s light, its total brightness diminishes. Kepler detects that as a variation in the star’s total light output and evidence for planets. So far more than 2,500 possible planets have been detected by this technique with Kepler. The Gemini data utilized the Differential Speckle Survey Instrument (DSSI) on the Gemini North telescope. DSSI works on a principle that utilizes multiple short exposures of an object to capture and remove the noise introduced by atmospheric turbulence producing images with extreme detail. 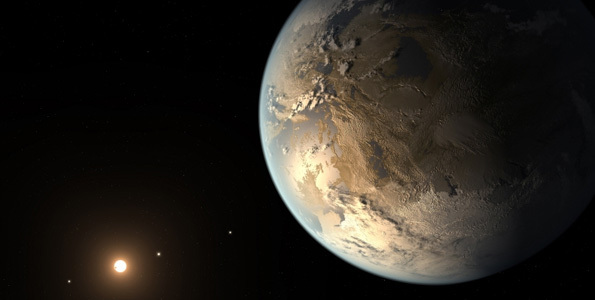 “The observations from Keck and Gemini, combined with other data and numerical calculations, allowed us to be 99.98 percent confident that Kepler-186f is real,” said Thomas Barclay, a Kepler scientist and also a co-author on the paper. “Kepler started this story, and Gemini and Keck helped close it,” Barclay said. Observations with the W.M. Keck Observatory used the Natural Guide Star Adaptive Optics system with the NIRC2 camera on the Keck II telescope. NIRC2 (the Near-Infrared Camera, second generation) works in combination with the Keck II adaptive optics system to obtain very sharp images at near-infrared wavelengths, achieving spatial resolutions comparable to or better than those achieved by the Hubble Space Telescope at optical wavelengths. NIRC2 is probably best known for helping to provide definitive proof of a central massive black hole at the center of our galaxy. Astronomers also use NIRC2 to map surface features of solar system bodies, detect planets orbiting other stars, and study detailed morphology of distant galaxies.